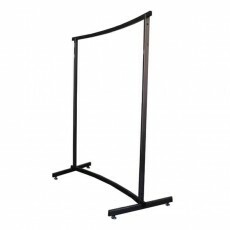 Misconceptions can be made about garment rails for fashion retailers. However, their refined appearance does not mean they are not able to handle heavier pieces of clothing. 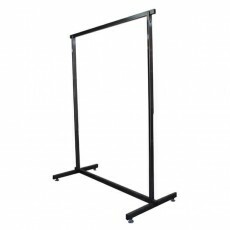 These free standing models are heavy duty, which means that you will be supplied with lasting stability and hanging power. 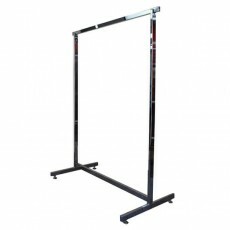 Robust feet ensure that these clothing rails stay in place, meaning that they will not budge unless you want them to. Creating an attractive display often requires a lot of trial and error. But with our range of Italian clothing rails, we help you to showcase your products in their best light without having to try. A good display will tell the story of your business and compels a customer to pick up your merchandise. Choose from our range of finishes including gun metal and chrome that cast a contemporary ambience matching almost any design. This line comes in either a straight or curved design.The straight design offers a neat and practical charm, whilst the curved option boasts a softer appeal. 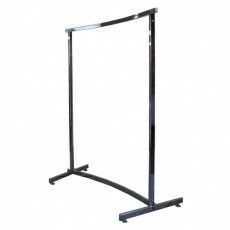 So you will be able to uncover clothing rails that fit with products rather than clash with them!